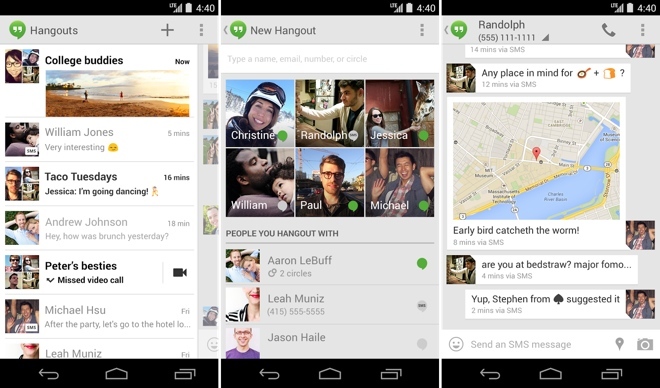 Google has updated the Android version of the Hangouts application with several new features. As we have seen on the Nexus 5, the Hangouts app now supports SMS and MMS, which means you can send and receive text messages from within Hangouts and they will appear along with your Hangouts chats. Unlike the Nexus 5, however, you can disable the SMS/MMS functionality if you want and continue using the stock messaging app on your phone. Another addition is the ability to set your mood. You can now choose from one of the Hangouts emoji as your mood that gets displayed to anyone who messages you. You can also choose to announce the device type you are messaging from (phone or PC) or whether you’re in a call. Lastly, you can now also insert your location and animated GIFs in a chat. The iOS version of Hangouts has also been updated but it lacks the SMS/MMS functionality and ability to insert location but gets the other features such as moods and sharing device type. You can download either version of Hangouts from the link below.